Visit Buffalo Niagara President and CEO Patrick Kaler says hundreds of volunteers will be on the streets helping fans find their way around the area. 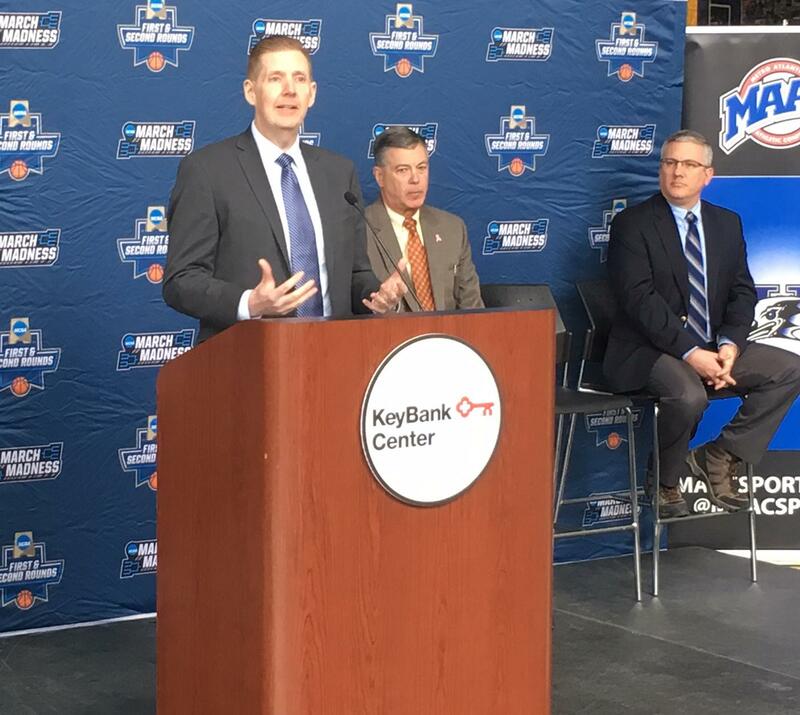 Visit Buffalo Niagara President and CEO Patrick Kaler takes part in welcoming college basketball fans back to Buffalo. Since the last tournament held here, Kaler says more than two dozen new restaurants and four new hotels have opened downtown. "If you think back to 2014, HarborCenter and Canalside were all under construction. So they're going to be coming back and seeing a whole brand new Buffalo. And our volunteers are so excited about talking about all the great things that they enjoy to see and do and eat and play in Buffalo with all the fans that will be coming to our destination," Kaler said. Rounds one and two will be played Thursday and Saturday at KeyBank Center. Metro Atlantic Conference commissioner Rich Ensor says it takes a great team to host the tournament. "It's part of the reason why Buffalo has become the center for amateur sports in the Northeast. Whether it's ice hockey or basketball, they've shown here in Buffalo that they can put together the team of folks that can make these events happen. They don't happen without a great public and private partnership," Ensor said. The event is expected to have an $8 million economic impact on the area, Kaler said.